What does the HDI measure? I’m just studying and going through my notes, and had a quick question. In topic 4 when you were talking about GDPs and the Gini Index you said that there actually was a correlation between countries with a high GDP and a low Gini index, but isn’t GDP used in calculating the gini index? So wouldn’t it kind of skew the data, forcing the gini index to be more likely to follow the same pattern as the GDP? Thanks for the question. I’m almost certain that I didn’t say that, since there’s generally no correlation between the Gini Index and the GDP. Some rich countries have relatively high equality (Sweden, for example) and some have high inequality (USA). Conversely, some poor countries have high levels of equality (India), while some poor countries have very high levels of inequality (Central African Republic). What I most likely said was that there was a very high correlation between a country’s GDP and is score on the Human Development Index (HDI). 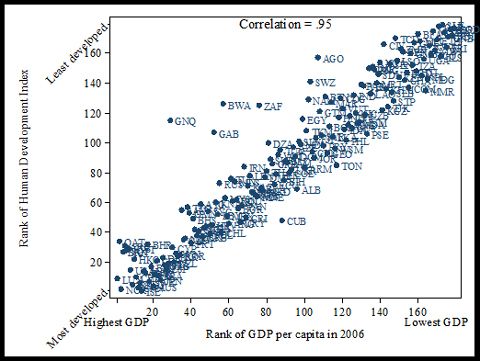 Just a bit of research…turns up this interesting bit of analysis by Justin Wolfers at the NY Times Freakonomics blog, showing a correlation of 0.95 between a country’s HDI rank and GDP rank (2006). That’s an exceptionally high correlation, suggesting that the HDI isn’t measuring much more than the country’s level of GDP. Wolfers created a graph using the 2006 data for GDP rank and HDI rank, while I provide for your viewing pleasure below.